Developers at Lima Sky dropped by our office today so that I could play Doodle Jump... on the Kinect for Xbox 360. We got an exclusive reveal of the game today, and you can watch it in action in the video above that features yours truly dancing around in front of our office Kinect. You've probably heard of Doodle Jump. You've probably even played the adorable platformer on your mobile device. After selling a whopping 10 million downloads, developer/publisher Lima Sky decided to jump their adorable Doodler dude to the Xbox 360 for some Kinect action. The translation from an upwards-scrolling platform game to a motion-centered Kinect game wasn't immediately apparent to me. Would you sway your body left and right, as you did with the accelerometer on your iPhone? Shooting would almost definitely have to be a hand projected motion (which rang true in the actual game), but how would all the power-ups you pick up along the way function? With the help of Smoking Gun Interactive — a team of developers specialising in cross-platform titles — Doodle Jump creator Igor Pusenjak and Lima Sky successfully rebuilt the mechanics in a way that made sense for a Kinect game. The first obvious change needed was the transition from the mobile version's randomly generated sets of levels to specific level designs. But the Kinect-specific requirements meant that Lima Sky had to change the basic controls of the game. Sidestepping navigates your hopping Doodler between platforms. You can set off an EMP blast to knock out oncoming grenades with the motion of a clap. If you find a pair of wings laying around, you can fly through the level by flapping your wings (arms). It's all very intuitive. Oh, and if you're wondering what that awesome chiptunes track is, it's "The Information Chase" by Bit Shifter. 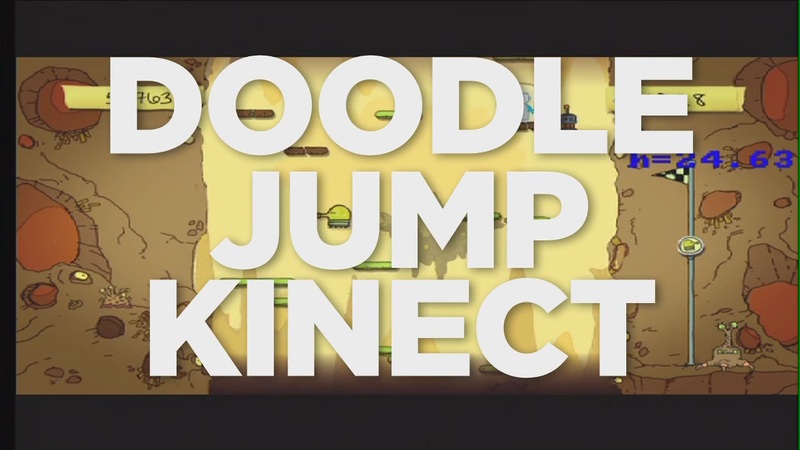 The in-game music for Doodle Jump on the Kinect isn't final, but we decided to throw something on top for funsies. Enjoy! Cool, hopefully it costs as much as the iPhone game.